I have something terribly gross for you. Something so detestable you certainly won’t think of it like reusing a toothbrush. A bathroom act that asks you to wash and reuse. This despicable act is to reuse your floss. Floss is different from a toothbrush or comb because it goes in your mouth. It is now infected with disease and should be immediately be thrown out. Do not even think of rinsing it off and using again. Definitely do not be place it next to the toothbrush that you will rinse off and use again. Remember, the Earth has infinite resources and we should not worry about little things like floss. There is enough landfill space for billions of strings. We have enough room for the daily floss of 8 billion people and the 2.9 trillion pieces they could use each year. So the next time you floss avoid reusing it. Make sure to throw it away and buy more at the store. It’s cheap and you can always grab some money off your money tree. To explain all this let’s start with what Zero Waste means. The concept isn’t about throwing things away, like most think, it’s about sustainability and recycling. We are all consumers and will continue to be, and the goal isn’t to get rid of consumption but to modify it. To create a system where everything we use ends up someplace other than a landfill. California set a goal of a 50% reduction in 1989. In the last decade, most of the state has achieved that and surpassed it (the current statewide rate is 65%). Now, the government has upped the ante, asking for 75% by 2020. Staging a One Planet Olympics in London would help achieve the ﬁrst sustainable Games. Sustainability has been at the heart of the London 2012 Bid and Masterplan. Why can’t mainstream media cannot write about sustainability? I am often frustrated by the lack of depth in articles about sustainability. It’s as if all writers and “experts” are recycling the same content. We all feel this impending sense of climactic doom and want to make changes, but then we are fed the same tips we already know. I think I’ve discovered why this is happening. You can do it, go Zero Waste! 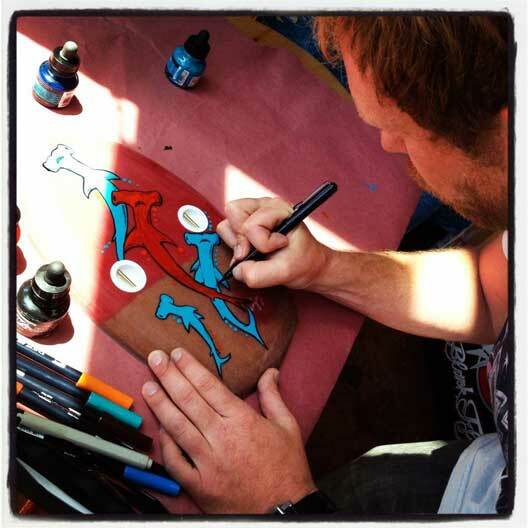 *Enjoy handplanes set themselves apart in the bodysurfing industry by turning their creations into one-of-a-kind art. It is amazing, the creativity and beauty they put into these little planes, with everything from DIY craft to pure artist illustrations, simple coloring and classic lines. Of course, one has to mention that all of these handplanes are made from recycled and reused material. They use old, trashed surfboards and environmentally responsible resin for glassing. Definitely a part of the Zero Waste mantra. Take a look and you might just be tempted to buy one. You can also join the *Enjoy community by visiting their vibrant Facebook group. **All these photos, and more, can be found on the *Enjoy Facebook Photos page. I’m the radical sitting next to you. I do things the American populace would consider crazy and yet nobody seems to notice. I slide by without a peep from the authorities. What am I talking about? I live a completely Zero Waste lifestyle. It’s hard to believe and you should see the reactions I get from others. Everyone goes wide-eyed, then the judging starts, and the skepticism. I don’t look like a radical, I’m not tied to a tree or wearing hemp clothes. I’m just an average looking guy. Largely, this means recycling the hell out of everything, and a lot can be recycled. In fact, one of the most powerful things you can do right now is go look up your trash company’s rules for recycling. I guarantee you will find new things to recycle. In the world of waste, the trash companies are, generally speaking, the most advanced green groups you will find. It’s such a simple move and yet so powerful, which helps because the next step is the hardest thing you will have to do. Eat better. I’m serious. As a man obsessed with trash I can tell you that the majority of our waste comes from our food. It’s also true that the more waste you create the worse you are eating. After all, a McDonald’s happy meal comes with like 16 things to throw away, while a homemade sandwich with an apple create very little waste. An obvious comparison but you will find that as you dig into this, eating healthier and healthier, it just gets better…and tastier, cheaper, greener, more social, and more interesting. Don’t take my word for it, just go out and try it. It will be one of the greatest things you ever do and also get you nearly to Zero Waste. Give it some time and you will reduce your waste by 90% or more. After that, all that is left is a lot of minor things. Like finding a restaurant that serves healthy food in recyclable containers or where can buy a recyclable toothpaste tube. Continue reading What does Zero Waste mean? 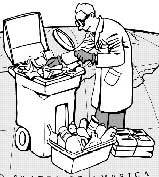 Posted on August 23, 2012 Author robotchampionCategories default, SustainabilityTags eat better, farmer's market, green, health, landfill, radical, recycle, throw away, waste, weird, what is, zero waste8 Comments on What does Zero Waste mean?